If you have any concerns,you can talk in confidence to Mrs Allen (Headteacher) who is the Designated Safeguarding Lead. Other staff fully trained as Deputy Designated Safeguarding Leads are Mrs Lyon and Mrs McLoughlin. Somebody is always here to listen. For further information on this, please refer to our School Safeguarding Policies. At all other times the Emergency Duty Team (EDT) acts as the ‘first point of contact’ for Children’s Social Care. EDT can be contacted using the same number as the MASH – 0151 443 2600. EDT will only respond to emergencies that cannot wait until the next working day. This is usually circumstances where there are immediate concerns regarding the welfare or safety of children or adults or if there is a risk of family breakdown and the Child(ren) are being placed in ‘care’. In the event that you have a Safeguarding concern about a member of staff, please contact the Headteacher directly. If you have a Safeguarding concern about the Headteacher, please contact our Chair of Governors, Mrs Heather Haddley, whose contact details are available from the School Office. In either case the Headteacher or Chair of Governors will then refer to the Managing Allegations Policy when investigating the concern. When assessing the needs of our children and families, we refer to the Knowsley Continuum of Need as highlighted above. 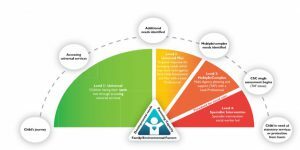 We aim for all of our children and families to be placed at either Level 1 or 2 on the Continuum. However in the event that circumstances result in children and families being considered to be at Level 3 or above, appropriate support and/or intervention is offered to address this. The diagram above illustrates the different thresholds of need and appropriate responses. Level 1 – All children accessing mainstream services with low-level need that can be met by a single agency. Level 2 – Children with emerging needs or low level CSE concerns that can be met with the support of a multi-agency Early Help Assessment and Plan. Level 3 – Children with multiple or complex needs including medium risk of CSE have to be met by targeted services or by a multi-agency Early Help Assessment or by other specialist assessments e.g.CSE Measurement Tool / Education Health Care Plan. Level 4 – Children who present with acute needs /risk. Including high level CSE concerns / risk. They will require specialist social worker or multi-agency statutory response.